Do you happen to remember the advertisement from the '60s for Camel cigarettes? I Would Walk a Mile for a Camel. I wouldn't walk a mile for a camel unless it was to meet that talking one on the GEICO Hump Day commercial but, I've probably already been about 11,000 miles in my 7 year-old Skechers. About seven years ago my corporate office (at the time) said they wanted the staff (except personal trainers) at our gyms to begin wearing all black casual shoes, not ones with high gloss leather, but not a pair of black Chuck Taylors either. In fact, unless one's career is athletic in nature, I am put off by employees wearing sneakers when they are serving guests, customers, members, etc. Nothing to me looks worse than nice business attire or a uniform bottomed off with a pair of sneakers. Okay, so the staff at Wendy's can be shuffling around in some Nike or New Balance, but not my waitress out at a nice sit-down dinner for the evening. The guys moving baggage through the interior of the airport can wear whatever, but I don't want to see pilots heading to their flights wearing worn-out high-top Adidas or bright neon Avia's on their feet. There are enough other options for comfortable work or business shoes nowadays. So, I went to the mall and purchased my first pair of Skechers. I wasn't looking for Skechers. Truly, I never gave Skechers one ounce of attention when I first heard their name. I thought they were shoes, or something, for kids. They could have named their company just Shoes and I would have been more inclined to check them out. There they are, in all their glory, after some yard work, in the photo above, after four years of work, 1100 gym work-outs, about 9,000 miles of cycling, a whole lot of yard work and some other activities or events for which I really didn't care to make a fashion statement. No tennis play for these puppies. 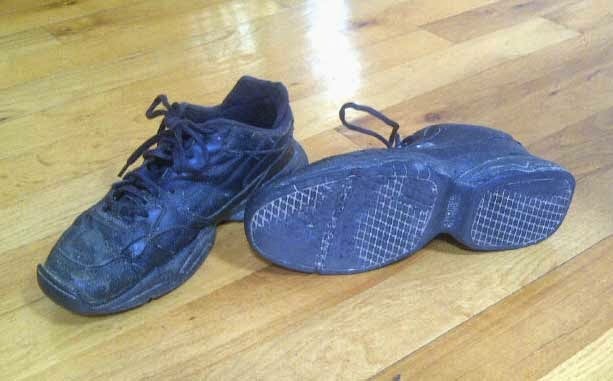 Other than the wear of the sole, there is not any part of this shoe that doesn't still provide what it did the day I bought them. Not even the laces are near needing replacement. These things were simply, well-built. They are a little roomier now, but that only spells comfort, to a certain point. Soon they will be relegated to yard work, stomping out fires, or something. This article, along with others about Blu, my water bottle, may lead one to believe I am a tight wad and I like using everything I own until it literally falls apart. The opposite was true not so long ago - I wanted most everything new and I went and got it. To me it's somewhat like that racket you get that just feels right and works better than any you've ever had - keep it and perhaps buy a few more 'cause you know that model will not be available in a few years, or even a few months. Skechers now has an extensive line of shoes for most everyone, doing most anything, except for a dedicated engineered tennis shoe. I am going to try out one of their training shoes (the one's that appear to be suited for tennis) soon and see what happens. I know they will not last as long as the first pair I purchased because of the nature of the game, but if they perform over such time as these have, I'll be more than pleased. Of course, they won't be black. I can wear a dark colored athletic shoe doing most anything, except playing tennis. There's something terribly wrong with that, to me.